As much as I love watching the seasons change…and as beautiful as the snow is, I’m officially ready for Spring. I love it when the world turns from white to green. I’m crossing my fingers it’s soon. March is going to be a fun-packed month! First we get to celebrate “green” day with St. Patty’s around the corner. Can anyone say corned beef and cabbage? Yum! Then, Easter is upon us. I love Easter! To watch the flowers bloom is such a beautiful thing. The baby chicks hatch, the tree’s bud and wake up form their Winter sleep, everything is new and wonderfully gorgeous again. But mostly I love Easter because I am reminded of how truly blessed I am. I am so truly grateful for my Savior and the sacrifice He made. 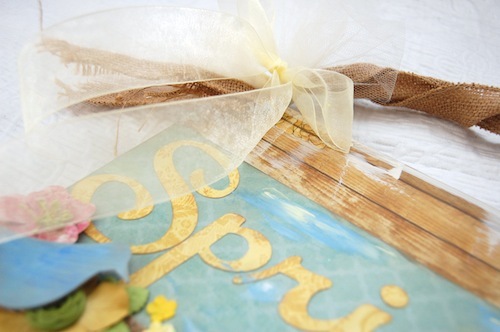 I so grateful for the celebration of His resurrection and the beautiful Plan of Salvation. 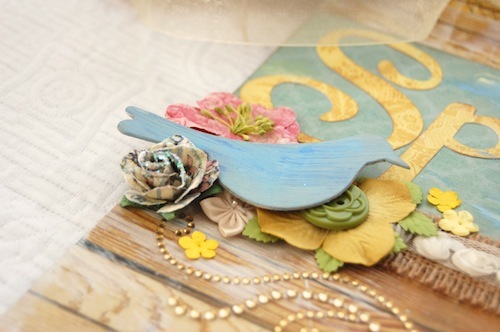 Aw, what a gorgeous project, Christie! I too love Spring and am enjoying the things that are starting to bloom out around here! Such great colors here … I have trouble with pastels but sure need to tackle that! 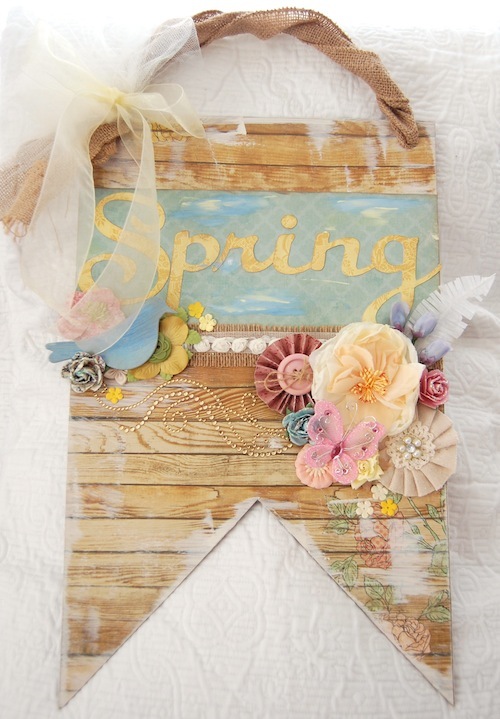 This hanging is so shabby and perfect for spring! 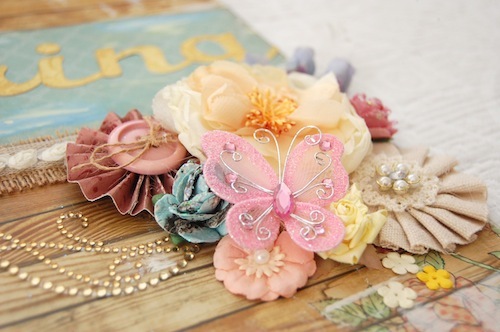 The flowers, bling and whispy ribbon are beautiful against the wooden background! Love it, Christie! These flowers are gorgeous and who isn’t ready for spring only we just got 8 inches of snow!! 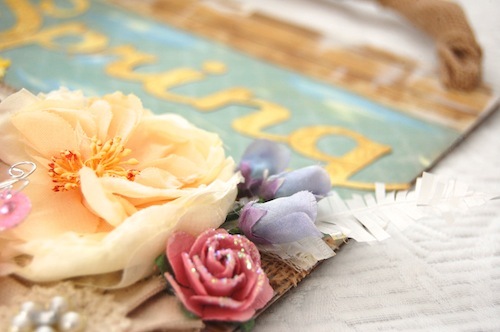 This is just lovely decoration!!! I love, love, love this. It is so beautiful. Maybe I should try and make one. Christie . . . this banner is adorable. I love all the spring colors you used. The flowers remind me of all the fruit & nut trees flowering here in Northern California right now . . . Like you we celebrate St. Paddy’s Day and in the blink of an eye Easter will be upon us this year . . . I can’t wait to see your beautiful Easter creations!!! I am ready for spring and you should have been here this weekend…spectular weather, and it’s supposed to be gorgeous all week! I want to be outside playing! I absolutely LOVE yourr hanging its adorable!!!! Hugs! totally beautiful colours on your project. hope you have a lovely easter !